Chichester Grange will meet on Wednesday February 6, upstairs in the Grange Hall at 7 p.m. The Grange meets only once during the month of February. Happy Birthday on February 5 to Darlene Cavanaugh and Brian Cavanaugh. Sign-up forms for CYA Baseball and Softball (T-Ball, Rookies, Minors, Majors) have been distributed at school. They are due back on February 22. A late fee will be charged from February 23 to March 1. For further information contact Steve Burris: sjb331@comcast.net for Baseball or Clark Thorne: clarkthorne72@gmail.com for Softball. Worcester Polytechnic Institute (WPI) has announced that Kyle Mitchell of Chichester, a member of the class of 2022 majoring in robotics engineering and mechanical engineering, was named to the university’s Dean’s List for academic excellence for the fall 2018 semester. Your favorite day of the month is tomorrow, Thursday, January 31, 2019. Everything 1/2 price day! Help us clean out winter jackets, socks, tights, hats, and scarves (and everything else). Remember to check the 25¢ clothing rack as they are 2 for 25¢ on 1/2 price day! We have a lady who needs kids’ skates: boys’ hockey size 3, men’s size 8, and toddler size 4. If you can check your old collection of skates and help out, that would be great. Also need sleds. Books $1.00 a bag! Baby clothes 2/25¢ /0-12 months! 345 Suncook Valley Hgwy, Chichester. Mon. 8-12; Tues. & Thurs 8-4; Wed. 11-4 & Sat 10-4. 247-7191. Don’t forget the “Winter Warm-up” schedule for Saturday, February 2nd at 6 p.m. at the library in the Community Room. Bring your favorite soup, chowder and/or comfort food (and serving utensils) to share with others, as well as a card with the name of the dish and its ingredients. Attendees will vote on their favorite dish and winners will receive a prize. Bowls, bread/crackers, beverages, napkins and utensils will be provided. RSVP the library at 798-5613 in time to save a spot. Even though yesterday was Library “Shelfie” Day, the library will be accepting pictures throughout the week. Take a “Shelfie” (a selfie) in the stacks at the library or with your favorite book and submit your picture to chichestertownlibrary@gmail.com to be entered to win a prize. More information has been posted to Facebook. We’ll be making valentines for veterans throughout the week of February 4-9. The valentines will then be delivered to the NH Veterans’ Home in Tilton and/or The Liberty House in Manchester for further distribution. Materials will be available at the library. The veterans really appreciate being remembered. Wednesday, February 6th is a special class in making valentines. Check to see if any spaces are still available for this class where participants will be using needle and thread to craft beautiful cards by calling 603-798-5613. Thanks to Elizabeth Marston for leading the class. For updates on cancellations and schedules, visit us on FaceBook and “Like” our page. The library does follow the lead of Chichester Central School on school closings or delays. You can also check with WMUR announcements/banners on closings or delays. As you may have heard in the last couple months, weeks or even days Chichester is in the process of amending its current zoning ordinance. The zoning amendment will allow Chichester to govern the town better and steer away from outdated soil maps. This will still be keeping with the Master Plan and understanding the desire to keep the rural characteristics of Chichester alive. There have been a lot of questions asked and answered at the meetings and around town. One of the big questions that everyone has asked is how will this effect my taxes or my current evaluation. The new zoning will not affect your taxes or your current evaluation at all. The tax evaluation is determined with your current lot as it sits. It is not determined on how many house lots you could potentially have in the future or if it’s agricultural or residential. If you are currently in a five acre zoning and the new zoning map updates your lot to two acre zoning your assessment doesn’t change. The only time the assessment will change is when you decide to change the use of your lot. I would ask for your support on updating the town zoning. If you have any questions please reach out to the planning board or myself to get the answers. We are having a public meeting on the zoning amendments on February 4 at 6:30 in the Grange, and I encourage all to come. The Epsom-Chichester Lions Club had an induction ceremony on January 10. 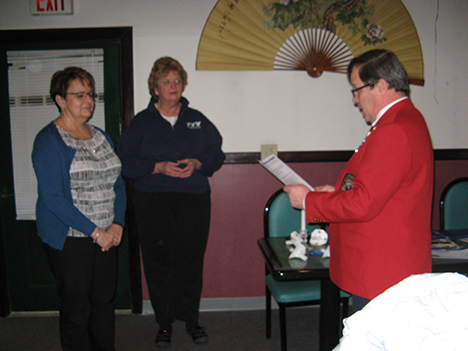 Steve Middlemiss, first District Governor of NH 44H District, conducted the ceremony for our new member, Wanda Davies. Nancy Fraher is her sponsor. For more information on joining the Epsom-Chichester Lions Club, please contact Richard Gibson, membership chair at gibjudi@gmail.com.